Regular readers of WoF know that we used to have a cherry 1963 Cessna 172D when we lived down in California, but sold our half when we moved to Eugene, Oregon. I now rent an almost identical '63 172D model, but as my aviation ad agency continues to grow, we are picking up more clients throughout the West, and another company plane is starting to make great business sense. My partner Julie just spent a couple of days on the phone with United customer service over in what sounded like Bangladesh trying to change a ticket so we could schedule a photo shoot with a new client in Wyoming. But due to (a) language problems, and (b) the usual airline weirdness, “Dolly” as she called herself, failed to make the trip happen, and “Bob” wasn't much better. He could understand our request, and in quite broken English, slammed us with about an $800 quote for changing the round trip to a multi-city flight. Screw that, I need my own airplane again! It needs to be fixed gear to save on insurance and annuals, and needs to cruise north of 140 knots and have the range to get throughout the 13 Western states on one fuel stop. It has to have enough useful load to carry 2-3 adults and their stuff, or the two of us and maybe a grandkid and all of his/her stuff(ed animals). It has to be IFR certified, and have a operating autopilot, preferably two axis. I'd like low airframe hours, but will settle for a mid-time airframe with a low-time engine. It has to have two radios, with at least one being flip-flop, and I'd LOVE a panel mounted GPS. All that, and it has to cost south of $100K. In determining the solution to this riddle, I realized that of all the planes that fit the above criteria, the one plane that does it all doe me is the 1979 or 1980 Cessna 182Q Skylane. At 75% cruise, the 230 HP engine will pull me along at 144 kts, but dirty, it stalls at a safe and sane 50 kts. It's 1,010 ft/min rate of climb will do nicely up to the 16,500 ft service ceiling, which is plenty high to get over any of the West's ranges. I LOVE the 92 gallons of fuel that will give me 880 NM range, and the 654 lbs. of load after the tanks are topped will haul the two of us and 299 lbs. of our crap a long, long ways. What draws me to the 182Q is that when all is said and done, it is still a nice, friendly Cessna. 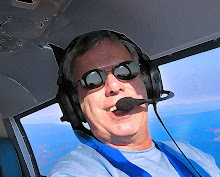 I've flown the 150, the 152 Aerobat, several 172s, and a 172XP, and without exception, they all fly exactly the same. The 182Q ought to fly just like the rest, and it'll get off the ground in 705 feet and land in just 590 feet...so it'll perform in high/hot or small strip situations easily. Docile, predictable and dependable...three words to describe the Cessna 182Q Skylane. Now all I have to do is line my ducks up in precisely the right order, wait for my ship to come in, and pray the stars will align properly. If none of that works, I'll just ask the Universe to make it happen. If you don't know what that means, click here and ask for Michael.